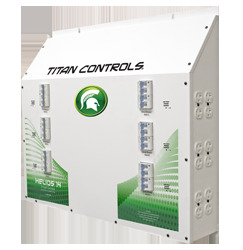 Sunlight Supply-Titan Titan Controls Helios 14 - 240V, 24 HID Light Controller with Timer (702832) SEEDS ETC. The Helios 14® lighting controller is specifically designed for operation of high intensity discharge (HID) lighting systems. The controller will run your lights for any sequence over a 24 hour period by adjusting the 24 hour mechanical timer. There is a variable (1 - 30 second) delay between each bank of eight (8) 1000 watt lights. This allows each 8000 watt bank of lights to strike before igniting the next bank of lights. The Helios 14® is easily serviced by a certified electrical professional by simply removing the front panel to access parts. The system can handle up to a maximum of twenty-four(24) 1000 watt HID metal halide or high pressure sodium (HPS) grow lights. . This lighting controller will provide up to a maximum of 100 amps of capacity on a standard single phase 240 volt circuit. The ETL listed Helios14® is built with only the highest quality components and will provide the user with years of trouble free service. This controller will run twenty- four (24) HID lights at 240 Volts.